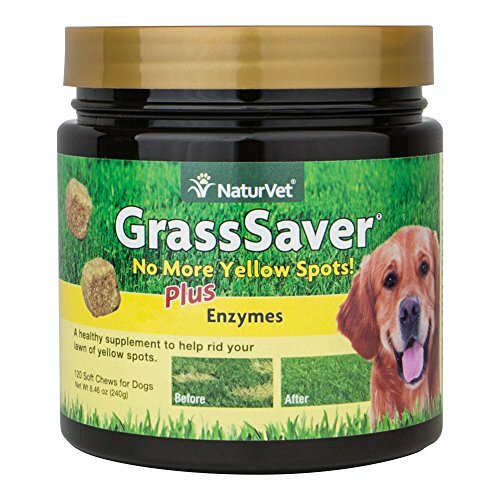 NaturVet GrassSaver Soft Chews Plus Enzymes Helps Rid Your Lawn of Yellow Spots. Contains Healthy Ingredients to Help Diminish Yellow Spots When Fed to Your Dog on A Daily Basis. Unique Formula with a Synergistic Combination of B-Complex Vitamins, Amino Acids and Added Enzymes. Also Contains Yucca to Help Reduce Stool Odor. Tasty Soft Chews 120ct for Dogs Only, Do Not Give to Cats. Instructions: Water Yellow Spots Heavily for Two Weeks. After Feeding GrassSaver for Two Weeks, Reseed all Yellow Spots. Guaranteed Analysis per Soft Chew: Moisture, dl-Methionine, Alpha-Amylase, Lipase, Cellulase, Protease and Bacillus coagulans. All NaturVet Products are Veterinarian Formulated and Manufactured in the USA in an FDA Audited, cGMP Compliant Facility with a 100% Satisfaction Guarantee. Veterinarian formulated grass saving soft chew supplement that helps to reduce and remove yellow spots on your grass caused from your dog's urine. Contains a unique formula of healthy enzymes, synergistic B-complex vitamins and amino acids. Also contains Yucca which helps to reduce stool odor. Helps to neutralizes the elements in your dog's urine that causes your nice green lawn to turn yellow. Safe for use on all dogs. DO NOT GIVE TO CATS! Our GrassSaver Lawn supplement is veterinarian formulated and manufactured in the USA in an FDA audited, cGMP compliant facility.